Why Won’t They Call Me Back ? I put in another call to RV Mobile Lube again this morning, and again got no response. I might have gotten a quicker response from them if I hadn’t told them why I was calling, but then if I hadn’t told them what would they know to come out and fix. So I’ll keep calling. While I’m waiting to hear tomorrow, maybe, I’ll get back on looking at my generator problem. 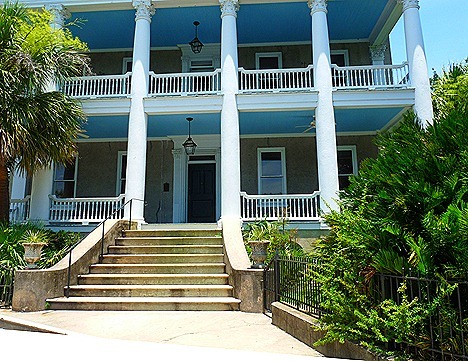 I haven’t had a chance to look at it since the 4th of July period when we were visiting my relatives in Athens, AL. As I mentioned when it happened when we were on our way up to Illinois this past June. It worked perfectly when we left Santa Fe on our way to Breaux Bridge, LA, and never skipped a beat along the way. And it cranked up and ran the next morning and also ran fine . . . for about 15 minutes, quitting before we made it on to I-10. And now it just cranks over, not even trying to catch. I’ve done the fuel pump test, so it doesn’t seem to be a lack of fuel. And I was checking out the generator actuator relay, but I didn’t get any further than that. So tomorrow I’ll be back on the phone with Onan going back over things and getting some more ideas. Since overall, today was not a very eventful day, I thought I’d repost some of our South Carolina adventures in October 2012 along with our friends, Nick and Terry Russell. Forts, Chapels, and Churches . 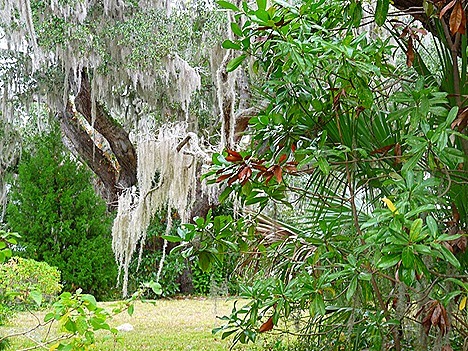 . .
After Hazelnut coffee and the last slices of Miss Terry’s delicious Pumpkin Cinnamon Bread, we all headed out about noon to visit Beaufort, SC, home of the Marine Corps’ Parris Island, and also their Marine Corps Air Station. 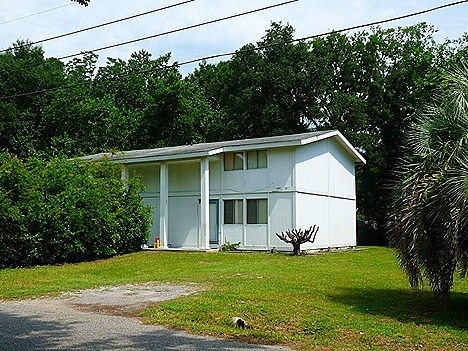 Jan and I lived here in Beaufort from late 1969 to late 1970 when I was working as a DOD contractor at MCAS on F-4’s and A-7’s. 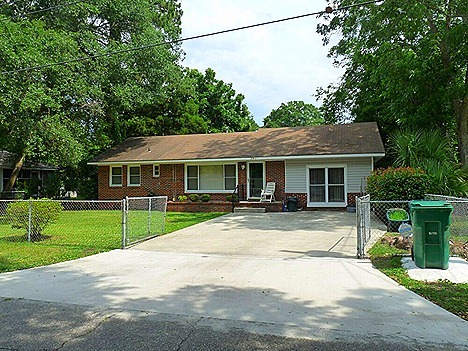 and this single family home was the last one. along with the many old homes. Next we took the bridge over the Beaufort River that leads out of downtown Beaufort (with Nick only sniveling slightly) and headed over to Ladies Island. 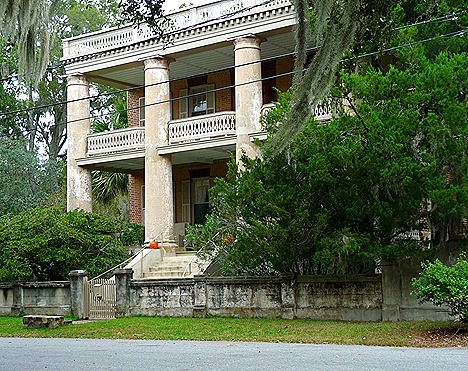 Then after a short snack stop at McDonald’s, we drove on down the St. Helena Island. 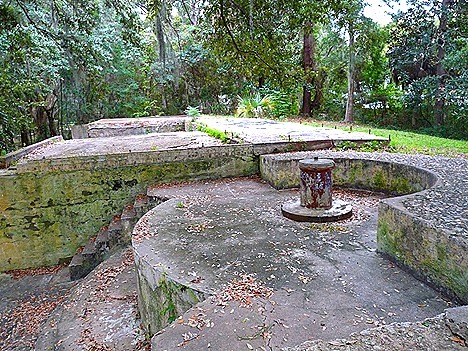 Our main destination was Fort Fremont, the remains of a Spanish-American War era fort. 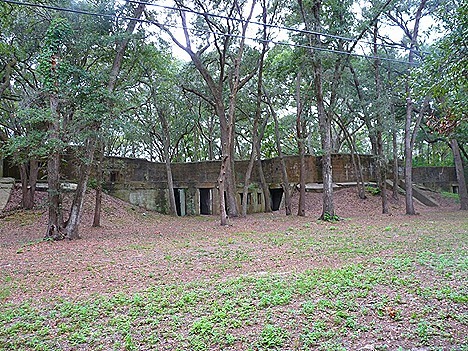 The original fort covered over 170 acres, but these concrete gun emplacements and the attached hospital building are all that remain. 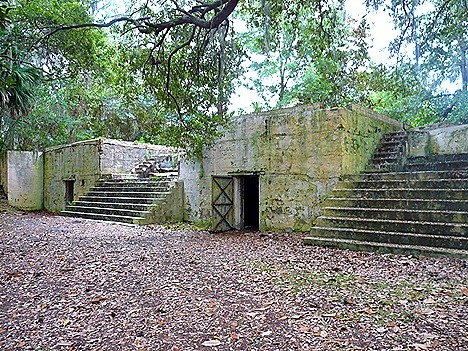 The other buildings, made of wood, have been destroyed or torn down since the fort was deactivated in 1921. 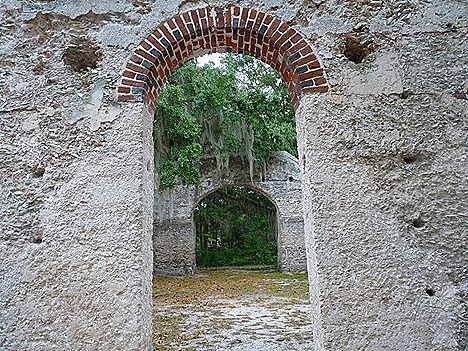 Driving back toward Beaufort we stopped off at these church ruins that we had passed on the way to the fort. We discovered it was called the Chapel of Ease. 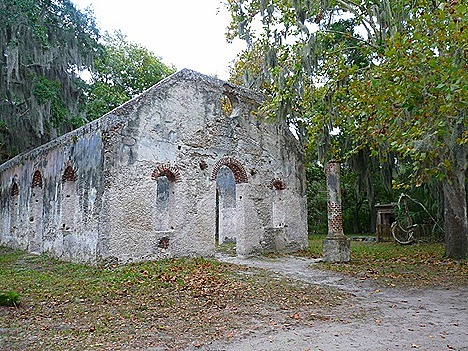 It was built around 1740 as part of St. Helena’s Church for planters that had problems traveling to the main church parish in Beaufort. 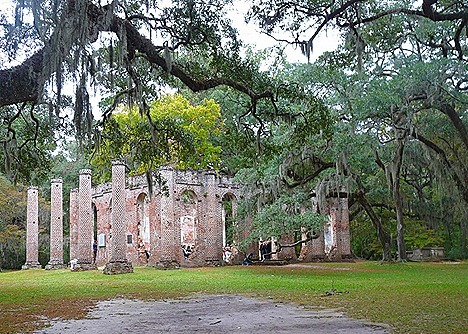 It became a separate church after the Revolutionary War, and was burned out in a forest fire in 1886. 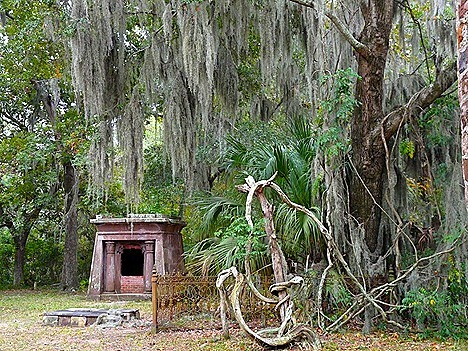 There is also a partially-destroyed mausoleum on the grounds which may have led to the stories of strange lights and ghosts in the area. 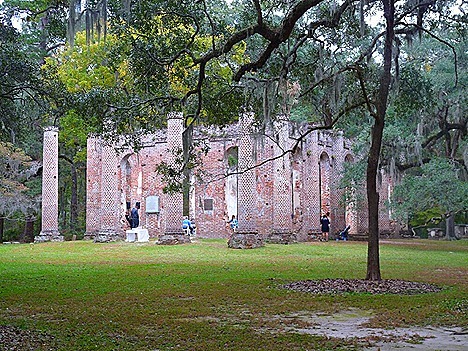 Next we headed back through Beaufort and up the road about 25 mile to the Yemassee, SC area to visit the remains of another church. Built between 1745-55, the Church of Prince William’s Parish, also known as Sheldon, apparently was a magnet for destructive military attention. 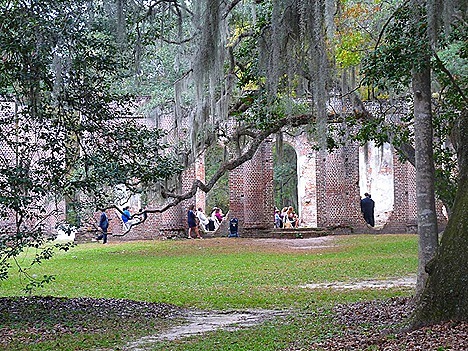 It was first burned by the British Army in 1779. 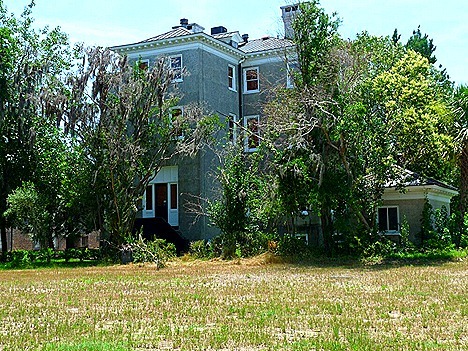 Then after being rebuilt in 1826, it was burned again by the Union Army in 1865. Sometimes you just can’t catch a break. We didn’t want to get any closer to the building because there was a wedding ceremony going on at the time. Leaving the church, we drove on into Yemassee to check out a nearby Mid-Atlantic/Encore/PassPort America park called The Oaks at South Point. Turned out to be a nice park, but with all the tall trees, it would be sheer luck if you could get a satellite signal. Finally it was time to head back to the park and dinner. We had decided to check out The Pink Pig. 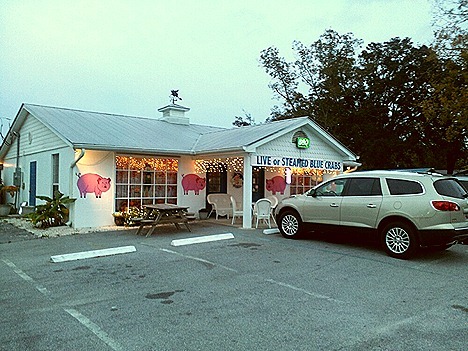 Serving BBQ and seafood, they’ve been mentioned on the Food Network and written up in Southern Living magazine. And we really enjoyed it. For their BBQ they have both tomato-based sauces, and the mustard-based sauces, typical to Georgia and South Carolina, including a hot Gullah sauce. I had a shrimp and rib combo platter, and the ribs were really good. meaty and moist. Since The Pink Pig was only about a mile from the park, it was a short trip. Which was a good thing, since we were all so full. We never really grow up — we only learn how to act in public. Though Jan says I’m still working on that part.